"Build your own system, base starts as keyboard tray only". Single Mouse Keyboard Tray or Dual Mouse Keyboard System. 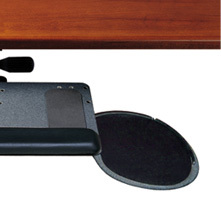 Dimensions: 20-1/2" W x 13-1/4" D.
We offer a full line of durable keyboard and mouse platform options created to meet the needs of a wide variety of individuals, workstations and office environments. Each of our platform options is designed to ensure that users type and mouse within their Neutral Reach Zone, thereby encouraging safe, sustainable working postures. 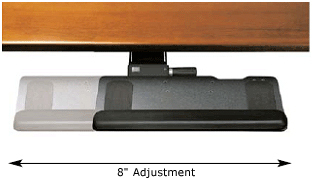 By combining one of these platform options with one of our award-winning mechanisms, you will create the most non-intrusive, intuitively adjustable keyboard support available. All of our keyboard and mouse platforms are made of phenolic, an ultra-strong, remarkably thin (1/4") composite that`s non-toxic, durable and easy to clean. Humanscale 100 Combo Platform: Unique reversible design. 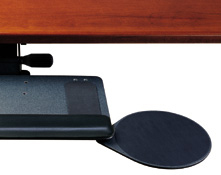 Positioned with the straight edge toward the user, this platform works with most standard keyboards. Positioned with the curved edge toward the user, this platform fits the Microsoft Natural Keyboard. Available with any of our mouse options. Dimensions: 20-1/2" W x 13-1/4" D.
Question: What is the difference between track and track length in Options? Answer: Track refers to the various track lengths offered. Choose a track length based on the depth of your desk. The reason we also have "track length" as another option is to ensure that you have measured clear space under your desktop, front to back, and the track you ordered fits under your desk. Please note, that the word "clear space" is very important. So if you have a bar running across the length of your desk underneath, the full depth of your desk will not be counted as clear space. Please note that the standard recommended track length is 22", as it ensures that you can push the keyboard tray fully under the table top. Anything less than 22", you would have the tray and the keyboard tray sticking out.